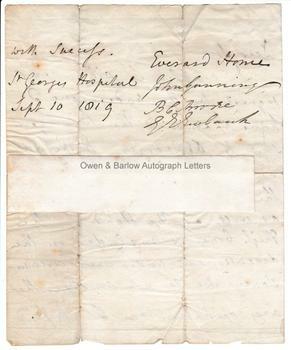 EVERARD HOME Autograph Letter Signed (to which the names of John Gunning, Benjamin Collins Brodie and George Ewbank are also appended). Sir Everard Home FRS. British surgeon. ALS. 2pp. St George's Hospital. September 10th 1819. To "Dear Sir". 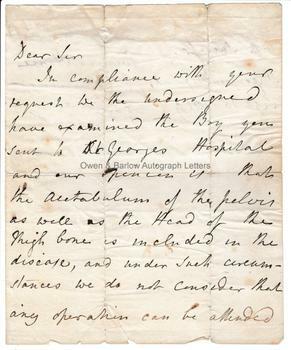 In compliance with your request we the undersigned have examined the boy you sent to St George's Hospital and our opinion is that the acetabulum of the pelvis as well as the head of the thigh bone is included in the disease, and under such circumstances we do not consider that any operation can be attended with success. Everard Home, John Gunning, B.C. Brodie, G.E. Ewbank." 4to. 23 x 18.5 cms (9 x 7.25 inches). Old folds and creases, a few small edge tears. The central horizontal fold line has been strengthened on verso with a piece of heavier weight paper or thin card. All else very good. Sir Everard Home was chief surgeon at St George's Hospital, London and in 1808 had been appointed Sergeant Surgeon to King George III. He was a noted anatomist and was the first to make an examination of the fossil creature found by Mary Anning at Lyme Regis (named the 'Icthyosaur'). Gunning, Brodie and Ewbank were Home's senior assistant surgeons at St George's, noted physicians in their own right.